In March, I wrote about using visualizations in JMP to inspect the quality of a couple of color name data sets (Part 1 & Part 2). 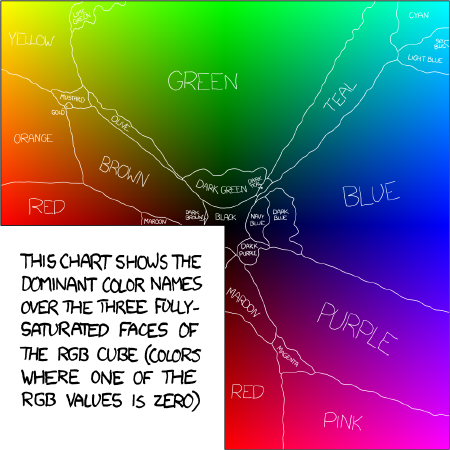 This week, xkcd author Randall Munroe has posted the results of his own color name survey, including some demographic information about each participant. He provides all the raw data, and I hope to try it out with JMP sometime, but for now I'll have to content myself with producing a variation of his color map image in JMP. Instead of labeling the dominant color regions, I recolored them with the representative color. For instance, all the points on the cube that participants identified as "green" have been given the color that best typifies green, as found by the survey. JMP details: I was able to import the raw text files with a little text massaging. Then I merged the data for the RGB cube faces with the data for the best RGB values of popular color names. I used the script from my previous post to color the points according to the RGB columns. Scatterplot 3D did the rest.